I’ve lived through a full home remodel… twice. And as anyone who’s gone through the process can tell you, it’s not for the faint of heart! Remodeling even one room in your house means chaos and dust and drop cloths and workers and choosing colors and textures and accessories and it’s enough to drive you crazy. So these are my tips for keeping sane during the chaos of your remodel. Sometimes you have to do whole sections of your home at one time, but if it’s at all possible, consider focusing on one room or one area at a time. During our first remodel we did ALL the things at one time. Later I regretted some of my choices in fixtures or paint colors and I think if I’d only been focusing on one thing (instead of trying to make choices for the whole house) I would have made smarter decisions. Between Pinterest and Instagram, there are a ton of fabulous ideas out there to inspire your home remodel. Create a folder in the picture section of your phone and screen grab your favorite ideas from home décor brands and your favorite designers. When the time comes to choose a paint color or a farmhouse sink you’ll already have your favorites ready to go. Looking for inspiration? Check out Formica Groups’ Pinterest Page — they have board after board of fabulous and inspiring ideas, including ideas for using their gorgeous laminates in rooms throughout the home. We made decisions during our remodel — when we had babies — that I wouldn’t have made for us now, when we have school age children. So don’t just think about what you want now, consider what you’re going to need further down the road If you have or plan on having a family or pets, think about Formica® laminate as a solution to your durability concerns! With their Eliteform technology on all their laminate products, durability and scratch resistance for laminate has never been better. Everyone has a style and you should absolutely embrace your own. That being said, be careful about trends. In a couple of years you might hate that crazy tile or wallpaper you chose for the dining room. When in doubt, make choices that will set the stage for your accessories and décor, which can be easily swapped out with the seasons. I tend to gravitate toward classic design and muted colors for my permanent pieces (i.e. shelves, cabinets). That being said, I like to make a bold choice in some of the smaller accessories (like an oversized chandelier, a cool color on the ceiling, or a fun pattern like this chic lime green Formica laminate end-table). Bold accessories can set your nest apart from the other birds. Back when I was a wedding planner I used to tell every bride to pick a few things she absolutely had to have and we’d splurge on those and then be more cost effective with the things that weren’t as important. The same goes for your home remodel. Choose the items that you want to splurge on (for me it was a really, really great stove since I love to cook) and then you can budget out the rest without losing the integrity of the design. 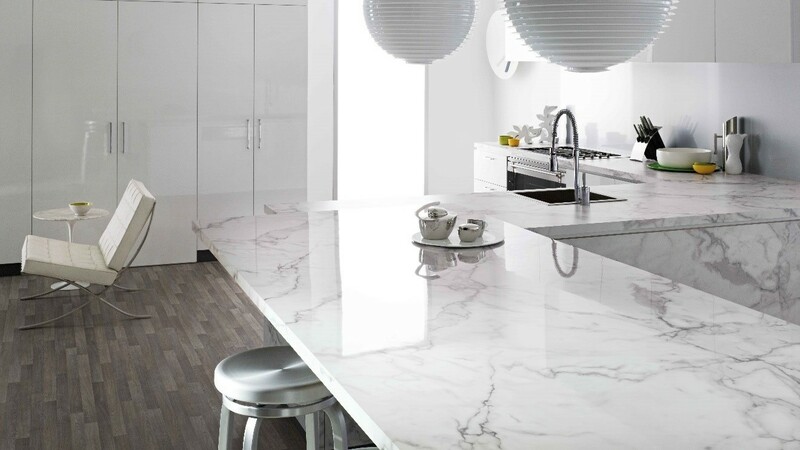 Formica Group does a gorgeous job of offering a huge variety of stylish, durable surfacing products that are as low as $14 a square foot but still look like you spent a million bucks! Any real estate agent will tell you that the best investment you can make in your home remodel is in the kitchen and the bathroom. They’re the areas a prospective buyer cares about most so it’s important that you take the time to make sure they’re gorgeous. Luckily, there are ways to easily refresh the look before you sell. Formica laminate counters can be installed in a couple of hours to create a high-end look for less! Remodeling is so fun… it’s also stressful sometimes. I wish I’d known this before I walked into the first time. Estimate that it might take longer than you think, be noisier than you imagine and add a little stress to your life. At the end of it all though you’ll have an incredible space that’s created just for you; I promise it’s worth it. See for yourself by taking a peek at my favorite home remodeling projects. For more great ideas for your home, follow Rachel and The Chic Site on Instagram, Facebook and Pinterest. This post is sponsored by Formica Group.